The Cornelius & Anthony brand is fairly new to the cigar scene, but the name is picking up notoriety at a lightning speed. Well-known for their cigarette tobacco, the Virginia family behind Cornelius & Anthony made quite the bold move when they decided to dabble in the world of fine cigars. When brand owner Stephen Bailey, whose family has grown Virginia tobacco for the past 150 years, made his cigar debut with the Cornelius line, cigar fanatics went wild. The final product was received with open arms by tobacco fanatics everywhere, and things only got better from that point forward. Cornelius & Anthony cigars are products of the highest standard, so a hefty price tag tends to come with the territory. 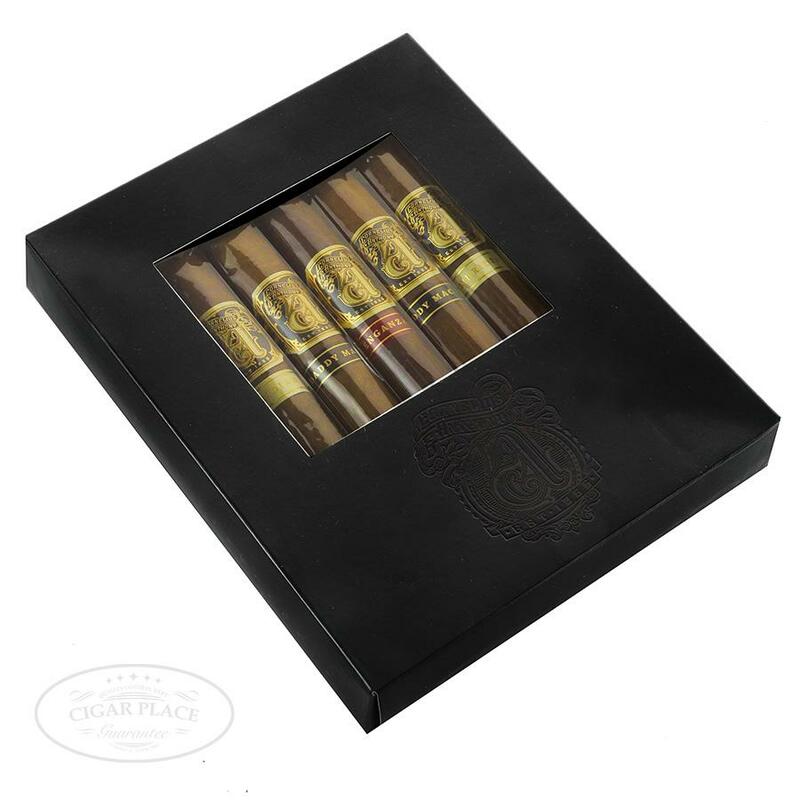 However, we at Cigar Place want our amazing customers to have a chance to try all the newest, hottest sticks on the market, regardless of MSRP, so we are pleased to offer this amazing 5 cigar Cornelius & Anthony sampler at a phenomenal price. 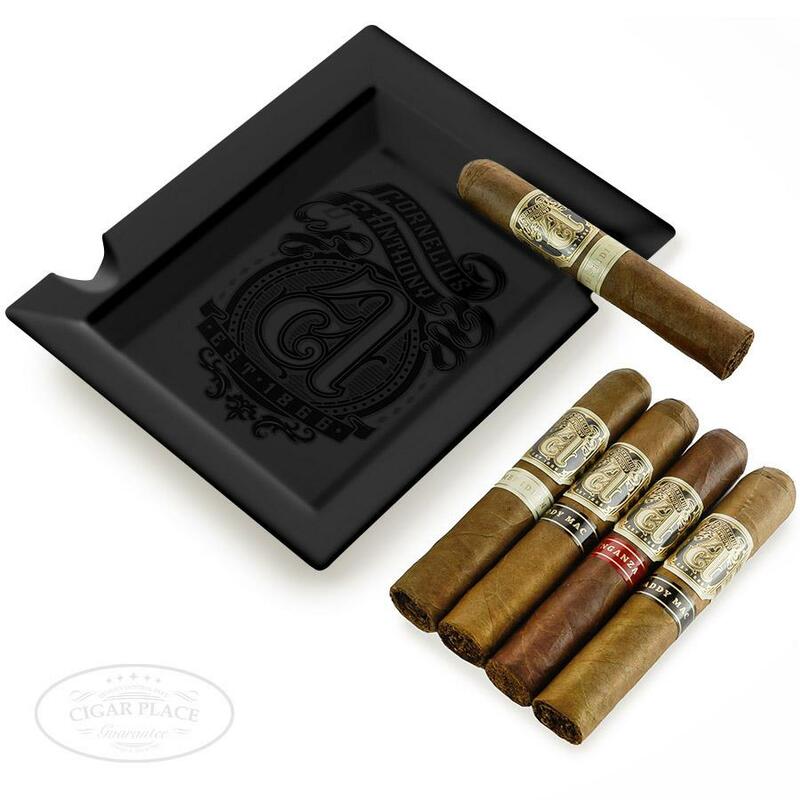 As an added bonus, this fantastic sampler even includes a highly collectible Cornelius & Anthony ashtray, beautifully engraved with the gorgeous brand logo! 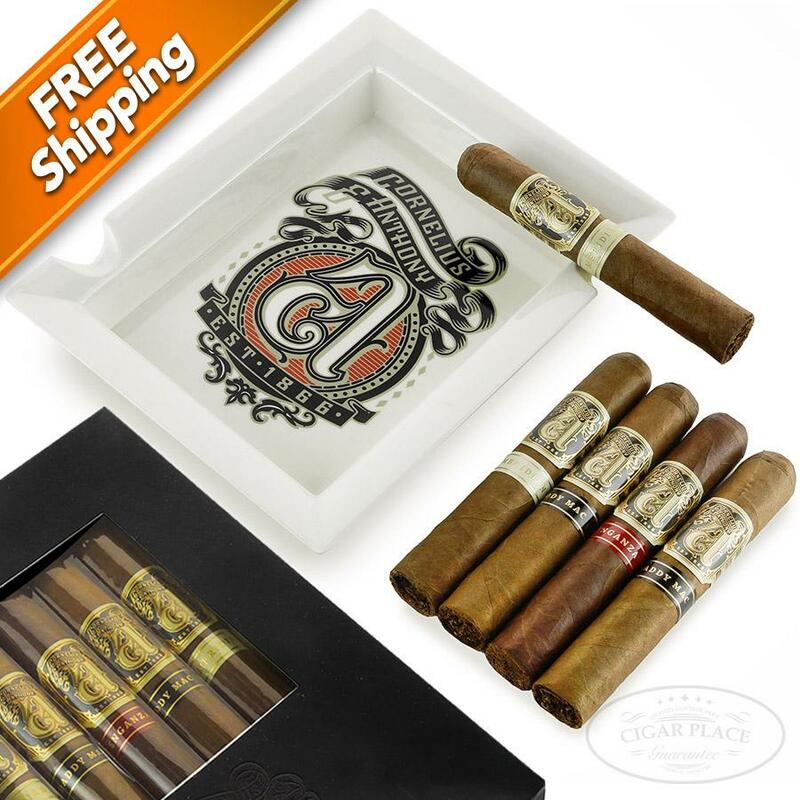 This awesome sampler is a no-brainer for just about any true cigar connoisseur, so it won’t last long! Get yours while the gettin’s good! 2 – Cornelius & Anthony Daddy Mac Robusto – 5” x 52 – A robust Nicaraguan and Ecuadorian filler and binder blend rest beneath a spicy Brazilian wrapper leaf, making for a highly complex medium-full-bodied smoking experience. Pepper and raw tobacco make up the base for the flavor profile, along with subtle hints of earth, cedar, and cocoa. 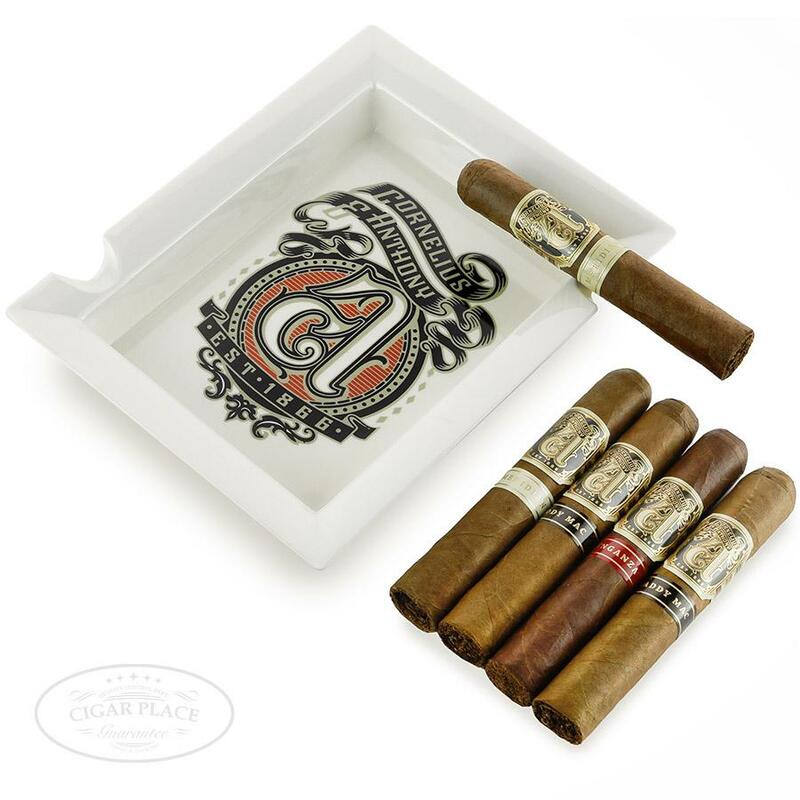 2 – Cornelius & Anthony Venganza Judge – 5” x 52 – Full-bodied, balanced, and delightfully eventful, Venganza is made up of a hearty blend of aged Nicaraguan filler and binder tobaccos and a velvety Ecuadorian wrapper. Ideal for those who love rich, strong cigars, Venganza produces delicious notes of cedar, bakers’ spices, and black cherry. 1 – Cornelius & Anthony Meridian Robusto – 5” x 52 – Tame, yet surprisingly complex, Meridian is a medium-bodied treat featuring a luxurious blend of Dominican and Nicaraguan fillers and a refined Ecuadorian wrapper. Meridian produces a beautifully balanced flavor profile featuring boatloads of sweet tobacco flavor along with spicy, woody nuances.